When you think of vintage Mens tank tops you may be taken back in time to the seventies, (if you’re old enough to remember) David Cassidy and lurid colours. 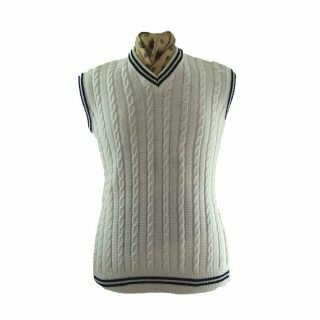 Whether it’s straight sided, traditional wool Mens kitted tank tops, embroidered, leather or suede, or fitted, brightly coloured and patterned 70’s Men’s retro tank top styles popular amongst a younger generation back in the 1970’s ,the tank top in today’s fashion is here to stay. Take a look at our range for a selection of different styles.These include cable knit, V neck, cropped and fitted seventies styles and more. Perhaps your parents wore them and you’ve vowed you’ll never be seen in public in one..Be daring and have a look round our excellent range of Men’s vintage tank top styles from different eras and brands. You’ll be glad you did.